The first picture of Game Fuel on March 23, 2007 long before it was even announced. Mountain Dew Game Fuel, produced by Pepsi Cola Inc., was a new version of Mountain Dew soda which was released on August 13th, 2007 and was available for only 12 weeks in stores. It was subsequently brought back for future game promotions, including one for Halo 4 in 2012, which was itself promoted with a phone game, Halo 4 : King of the Hill Fueled by Mountain Dew. Game Fuel is a cherry-citrus flavor dyed red. The bottles features the Halo 3 logo and a picture of the Master Chief along with the words "Game Fuel" and "Limited Edition". People who have tasted the drink have compared the taste of game fuel to the previously released "Code Red" which has a cherry flavor, and "Livewire" which has a citrus orange flavor, some have been surprised to find it tastes like a blend of the two. However some have pointed out that the flavor is similar to a liquid gummy bear; while people who dislike the drink have claimed that it tastes like cherry cough syrup. Each bottle of Game Fuel contains about 120 mg of caffeine or 73 mg per can. This is 30% more caffeine than normal Mountain Dew, which, as the label claims, is the reason why the product is the perfect "Game Fuel". For the release of Halo: Reach Mountain Dew had teamed up with Xbox to promote the release of Reach. The promotional campaign started on September 5th, 2010. Game Fuel was not a part of the promotion. Game Fuel returned in Fall of 2012, featuring a Halo 4 promotion called Unlock & Load Double XP, which allows players to earn double XP for Halo 4. The promotion extends to most Mountain Dew products, as well as Doritos chips. A Commercial was released along with the drink with footage from Halo 3 and John-117. The commercial shows people of different nationalities playing Halo 3 on Xbox Live and screaming "NOOOOOOOOOOO!" in their native tongues when they die. At the end it shows one American man saying "Yes!" (he was probably winning) as he takes a sip of Mountain Dew Game Fuel. Then the narrator says "New Mountain Dew Game Fuel, cranked up for Halo 3!" Game Fuel was actually available longer then 12 weeks, however after sometime it could only be found as cases of 12, Game Fuel was no longer available in any retail store sometime after February 2008, except for the collectors edition 16 oz bottles which are either extremely hard to find or have been retired. Game Fuel has returned many times after Halo 3 for various games. 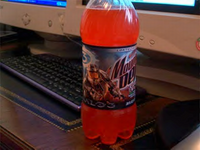 During Summer 2009, Mountain Dew has brought back Game Fuel this time promoting World of Warcraft, the new Game Fuel includes the original citrus-cherry version, and a new wild fruit flavor version. In 2011, Game Fuel returned to promote Call of Duty: Modern Warfare 3. It included the original citrus-cherry flavor and a green tropical flavor. In 2012, Game Fuel was brought back to promote Halo 4.